Having trouble finding a tire for the hard pack trails you love? 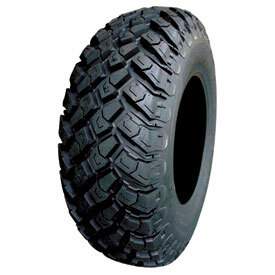 You could stay off hard terrain, or you could pick up a set of EFX MotoHammer Radial Tires and keep running full speed. Built around an 8-ply carcass, specially designed soft compound, and aggressive lugs, the MotoHammer is made to give you an absolutely massive contact patch for traction that feels like you’re running on asphalt. With the durability of a radial and the grip of the soft compound, you’ll love the EFX MotoHammer Radial next time you hit the hard stuff. They came right on time and were easy to mount on beadlock rims. If they wear well, maybe I'll come back and raise the rating. I ride in desert environment. Overall very happy with them. Yes you read that right. These tires look decent, which is one reason I bought them. But in less than 6 or 7 miles the wear on the rear tires is measurable. I doubt these will last 500 miles. I bought these because my rzr is street legal and they are 8 ply dot rated with a semi street off road tread. The Bighorns are good tires but clearly not for the street. I got 1500 miles out of the bighorns and mostly street. The motohammers looked like a nice mix of off road and street capability. But the rubber is wearing off like nothing Ive ever seen. Be forewarned if you buy these. I had read they dont last long but I wanted 31s so I took the risk. Now I regret it. I called efx and the guy just didnt seem to care. I think I have about 500 miles on these tires and they already have extensive wear. I doubt they'll last 1500. Very disappointed. I gave them 2 stars because the traction on these is really good, but I just can't afford to run them again after these wear out. I don't have but a week of riding on these tires, but I am happy with them. I have not tested them in mud, but I have just about everything else. Everybody said 10 psi was the sweet spot, but I found that to be a little too low causing a feeling of the tire "rolling under" in turns, and terrible handling on the street. Instead I found 15 psi to be pretty good, and I may even drop that down 2 or 3 more just to soften it up a little bit more. Overall, the tire feels grippy, absorbs bumps well, I have had no issues! I have a 2014 XP 1000 and got 4200 miles out of the original factory installed Big Horn tires. My racer and club member friends suggested I by the Moto Hammers so I could rotate them around and get more mileage. The tires never gave me a problem with performance on the trails or desert but I was only able to get 2500 miles of use before they wore to the wear bars and further. Rotating did not extend the life but did let them wear evenly front to back. A good tuff tire with strong sidewalls but be advised they will wear out quicker. How true to the advertised size on the sidewall do these tires run? Are they tall, on size or short? BEST ANSWER: As close as I can tell, these tires with 10 lb of air pressure measured 26 5/8" in diameter. They are slightly undersized compare to other brands. Which for racing is a good thing. The buggy is slightly lower! Ground clearance is not important in racing. These are also a "hard pack" tire. Not good in sand or mud, but very good on hard pack dirt. They were pretty true to size if I'm thinking right properly inflated maybe even a shade taller. BEST ANSWER: No, they are not directional. I rotate them through their use to get the most life out of the tire. I even remount them at their halfway point to move the inside to the outside. I got one complete race season from them! These are multi-directional. rotate as you please. what width rim do I need for the 30x10-15 moto hammer? I have itp ss 15 but hate the offset. I'm running them on a rzr 900s. Thanks. I want the tire to be under the fender flares. BEST ANSWER: Mine are only 10in wide on a motorsport alloys m31 lok 2 bead lock wheel all wheels are the same front and back. 32x10x16 efx motohammer I have a high lifter mostly under the fenders. Will the 31x10x14 motohammer fit on 2015 XP 1000 stock OEM front wheels (6")? BEST ANSWER: It looks like your stock wheels may be a 14x6. If so, then yes these tires will fit on those wheels. Remember to make sure you have enough clearance to go up in size. What ply is the sidewall on the MotoHammer tire? BEST ANSWER: I show that this is an 8-ply carcass tire. What is the weight of the 31x10x14? Thank you! BEST ANSWER: The weight of this tire is 39.35 pounds.